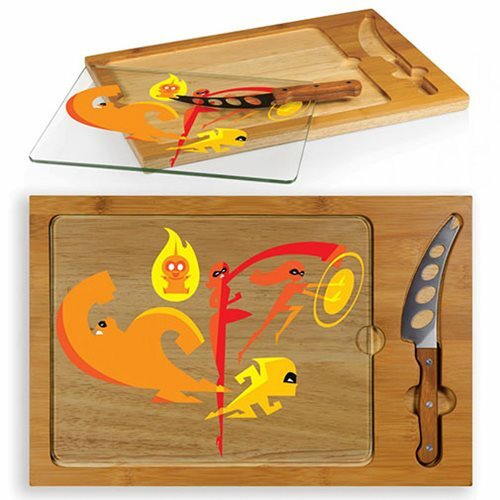 Sleek and unpretentious in its design, the The Incredibles Icon Glass Top Serving Tray and Knife Set is perfect for small get-togethers. Natural wood, glass, and stainless steel are merged into a simplistic piece for your entertaining needs. A three-piece set that has a solid rubberwood base with a bamboo rim accent, a tempered glass lid, and a cheese knife with its own carved out area in the wood base. So simple and elegant, it adds just the right amount of pizzazz when you're entertaining. Measures 16-inches long x 12-inches wide x 4-inch tall.